← Does doing one type of cycling make you more likely to try another type? 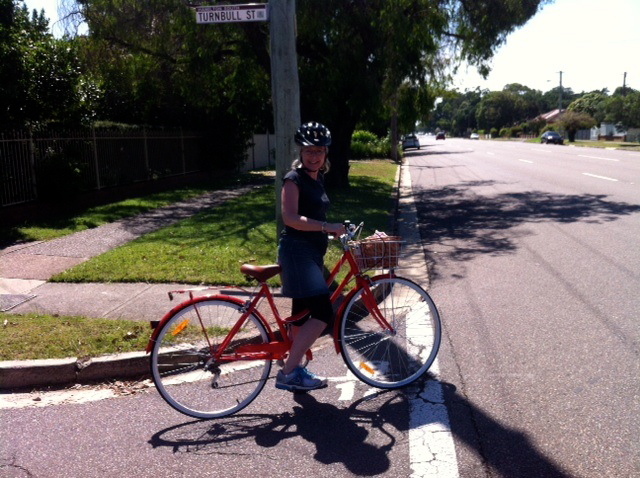 This week, in his very popular Sydney Morning Herald bike blog, Michael O’Reilly wrote and suggested various ways for women to overcome the material barriers. But his article presupposes that women will want to ride in the first place. He has missed the first step – how to make women want to ride. His tips were formulated with a woman who is a very keen cyclist and they would suit women who have already taken the first step of getting onto a bike and riding to see if they like it. To actually get those women to take that first step is the biggest hurdle. In my previous post I showed the above woman who is taking that step by getting a nice new, though probably cheap, women’s bike and practising riding it slowly in her neighbourhood streets till she gets used to it and builds up her strength. This is what to do. It looks lady-like and is not too hard and does not require meeting up with groups of women who ride and who are probably much faster and keener than her at this stage. Another tip Michael O’Reilly offers is for women to learn how to fix a flat. Very few women want to fix flats and the very thought of it will probably put them off riding forever. I am one of them, even though I can. I would say, get puncture proof tyres, they are excellent and mean you will probably never need to fix a flat. Ever. You will need to learn how to pump up tyres though, and that is not nearly as hard and your hands won’t get covered in grease. Steven Fleming has also added his ideas in his latest post. He suggests women advocate for separated bike lanes along the European model. This of course presupposes that women already want to ride – but they will not become advocates before they even start riding. Especially in the male dominated arena of bike advocacy. Women will take to bike riding when they can maintain their dignity, look attractive while still getting some exercise, when it is much cheaper than taking a car and it is safe. When they see lots of other people riding slowly in a non-lycra-clad manner along separated bike lanes and probably without helmets which may mess up their hair and adds that perception of danger. And when hoons don’t yell at them as they go past too fast and too close in their revvy cars. The first time you ride to work is the worst, you have to make sure that the bike is ready and the tyres are pumped up, work out what to wear, that your clothes are suited to riding or can be carried with you and packed accordingly. You must also have worked out the route you will ride as this is most likely quite different from the way you would drive. This preparation is well worth it. Once you get on your bike and start riding you will love it! Then you will want to ride with your kids to school and will want safer bike lanes, then you will see what a better city you would live in if most people rode, and then you will ask for better bike lanes. This entry was posted in Uncategorized and tagged advocacy, clothing, street cyclist, women on bikes. Bookmark the permalink. Nice one. The lady on the red bike has the right idea. Start out riding in the vicinity of your home, and gradually extend your radius to reach schools, shops and work. Yes, I was really impressed with her bike and the way she was riding it. She had a plan and was sticking to it well. Yes, I agree that the biggest hurdle is to get a woman on her bike. I just signed up to lead a women’s ride in June. Our local advocacy group is starting a women’s ride series. The rides are geared towards the beginner, using separated bike paths. With that said, my event is supposed to cover flat repair then a short ride around the neighborhoods. Of course, I will assess the group and ask if anyone wants to learn flat maintenance. I find that you only learn if yours is the bike that needs repair. That’s the best teaching moment. That sounds like a great thing to do Annie. I hope you get some beginners, if you do can you write it up in your blog? Women are not wusses on training wheels. We just can’t be fagged with the blokey culture. Get inclusive, guys! I started riding to work about 2 months ago. Before this I was completely terrified of cycling and hadn’t been on a bike for about 12 years. Two things motivated me to have a go. 1) A cheap bike came up for sale nearby at a time that coincided with cuts to the local bus service. These meant that I now had to get a taxi home from work at night. £8 for a 2 mile journey. 2) The other motivation was the desire to overcome my fear of cycling and to show my kids that being active is a normal part of life. Before this I went running but hurt my knees. Now I love my bike, called Doris, and am making plans for safe winter cycling.